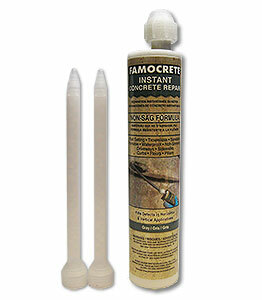 PRODUCT: Famocrete Instant Curing Concrete Crack Repair, for Vertical or Horizontal Cracks. About 6.1 Oz Net (packaged in a standard 10 oz cartridge). Includes 1 mixing nozzle and Nut. Price/Each. DESCRIPTION: Instant curing Famocrete™ is a ridged, sag-resistant all purpose concrete repair product for broken or spalled concrete. 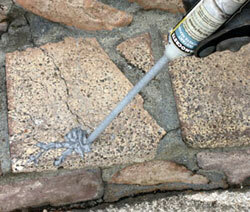 Famocrete is easy to apply and is supplied in ready-to-use standard 10 oz tube, which uses a standard caulking gun. It cures very hard and forms a strong bond to concrete. It can be ground flush after curing. Famocrete is environmentally friendly, odor free, less than 1% VOC and no solvents. Unused product can be saved for later use (within 60 days; a new mixing tube is required). CURE: 5 to 20 minutes. APPLICATION TEMPERATURE: 35 to 100F. MIXING: Shake WELL before opening. Put tube in gun. Hold tube straight UP. Remove plugs. Attach a new mixing tube. Pump to fill mix tube WHILE TUBE is straight up so no air is trapped. Point downward and immediately pump 4-5 inches into a disposable cup then immediately start on the cracks and spalls. Do not STOP pumping for more than a few seconds. Pump continuously until job is complete. Any significant stoppage will cause product to start to cure in mixing tube. Do not use any other kind of mixing tube. You must use an 18:1 to 32:1 leverage caulking gun. Famocrete is a 2-part 100% solids polyurethane. The two parts are mixed in the tube nozzle during application and begin to set immediately. WORKABILITY TIME: The material can be troweled for up to 3 minutes and is ready to sand, grind, and paint after 1 hour. YIELD: Each cartridge yields 14.4 linear ft at 1/4” (4.32m at 6.3mm) bead. Crack-Tite Concrete Floor / Slab Crack Repair, Polyurea, 100 ft.